Genetics present the single biggest opportunity for growers to increase their bottom line. As shown in recent genetic trials, there is significant variability in the profitability of sheep, both within and between different bloodlines. Therefore, an opportunity exists to capitalize on this variation and select the most profitable sheep in the industry for your sheep enterprise. This is where Bluechip Livestock comes in. Bluechip Livestock can assist you to access the best genetics in the industry to suit the your situation through our Premium Livestock Exchange. By providing objective data to underpin the sale of stock you can be sure you are getting what you need to improve your business. Imagine being able to harness the most profitable genetics in the country for use on your property, increasing your income through more profitable sheep without increasing your current costs. 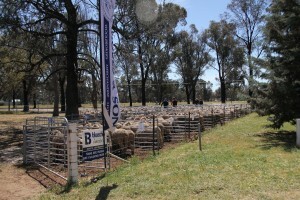 Bluechip Livestock offers sheep classing, Ram Selection and purchase and sale of sheep based on performance assessment. Do you have sheep to sell? Looking to buy more and improve your flock genetics?